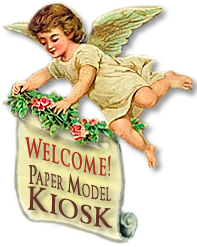 The Small Christmas Crib is a classic paper model reprint from Germany's Schreiber-Bogen Kartonmodellbau. Its five glossy, heavier-stock sheets also contain assembly instructions in English. 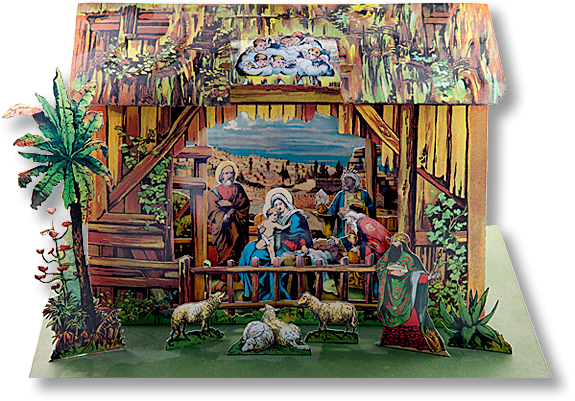 Ease of assembly is rated by Schreiber-Bogen as "1," on a scale of 1 to 3, so even younger enthusiasts will enjoy constructing this lovely nativity scene. The manger is made up of wooden planks and topped with a hay roof, and, through the front opening Bethlehem is seen (mouseover a thumbnail at the to of the page to see it). Size: 10.63 x 10.24 x 4.72 inches. A similar Schreiber nativity sheet is selling on the Web for over $85.